Editors note. The following is our weekly winners recap from our new contributor James A Gagnon. James will be recapping each week of the NFL action at FanDuel and DraftKings. 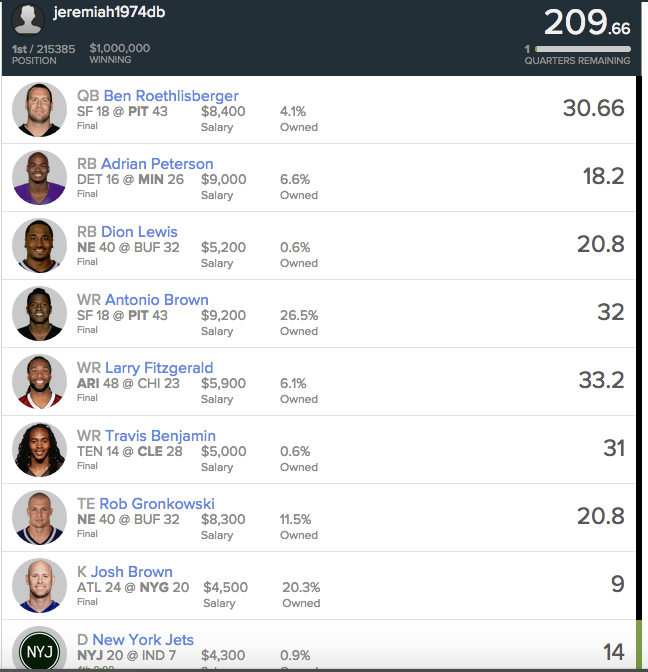 This entry was the first and only entry “jeremiah1974db” has ever played on FanDuel. Nice ROI. According to FanDuel’s facebook post here, this was the only entry jeremiah1974db has ever played. Ever. That’s incredible. The way to win this week was easy; have as many Patriots and Steelers as you could afford. Oh, and Larry Fitzgerald (yup, Larry Fitzgerald). Of the 90 players rostered among the top-10 winners from FanDuel, 40 of 90 were from N.E. and Pitt, with 9 of the 10 teams rostering Larry Fitzgerald as well. On DraftKings, the numbers were almost identical with 40 of 90 players being Patriots and Steelers, and 8 of 10 with Fitzy. New England and Pittsburg are two of the top offenses in the game AND had a receiver who had a great matchup. Yet ownership was down for a few reasons. First, New England was on the road in Buffalo. The Bills just came off an impressive win against a team in the Colts that were supposed to be an elite offense. Two weeks into the season and we haven’t seen that from Indy yet. But I digress; Rex Ryan is now at the helm for Buffalo, whose had success against the Patriots. The Buffalo fans were going to be rabid. These were all great reasons for owners to shy away from Patriots players…, then the game started and Tom Brady threw for almost 500 yards giving owners of him, Gronkowski, Edelman, and even Dion Lewis all a very happy feeling on Sunday. As for Pittsburgh…what an offense, huh? If you’re reading this, you already have enough sports knowledge to know the strength of the Steelers has switched sides of the ball from Defense to Offense. But with the Steelers pitted against a San Francisco defense that looked great the previous week… a game we all got to see in a prime time Monday Night Football game… it deflated the ownership percentages of most Steelers. DeAngelo Williams is currently the starting running back for one of the best offenses in the league. Both of the main sites use versions of PPR scoring, and DeAngelo’s always caught the ball well out of the backfield. Yet, his salary and ownership rate in DraftKings was $5,300 and 3.7% and $7,400 and 2.7% owned in FanDuel. The last immensely important player to be owned this Sunday; a player on all three million dollar winning teams, is ol’ Fitzy. I like having fun with his name if you can’t tell. Larry Fitzgerald had the 12th highest scoring output on DraftKings in the last 2 years yet he cost a paltry $5,400 and $5,900 and was still only owned less than 6.5% in both leagues. The reason I’m beating the low ownership rates like a dead horse is because expected low ownership can benefit you by submitting “contrarion lineups.” DraftKings provides a 7 Laws strategy article by Jonathon Bales that is extremely useful and written by an expert I highly suggest you use as a tool. The article gives 2 examples of the benefits of a contrarion lineup. The 2nd example is pure numbers. If you own a player rostered in 30% of the lineups in last week’s DK $10M NFL Sunday, you and about 128 thousand other owners are all gaining the same ground. But if you hit on a guy owned in less than 10% of the lineups, then you’re jumping at least 90% of the contestants with every positive gain. The last piece of advice regarding contrarian/low expected ownership players, is to obviously be smart with how many you play. Bales suggests 2 to 3 in football. Low ownership usually means lower salary to help play more studs anyway. The other strategy employed by most of the top winners this week is called “stacking,” which is simply using 2 or more players from the same team. Usually, this is a QB and a WR or TE. There was Big Ben or Brady to a position player stack in 17 of the top 20 teams. 18 of the top 20 teams had at least 3 players from NE and Pitt. 14 had 4 or more. 3 had 5 or more. One team utilized both of the above strategies and found a way to own 7 players from the Patriots and Steelers. Even with the matchups being tough, these are still very popular teams with great offenses, so those 7 players cost Kathy843 $42,00, leaving only $8,000 to fill 2 positions; RB and Flex. Those positions were filled with Danny Woodhead($4,000 – 16.4pts.) 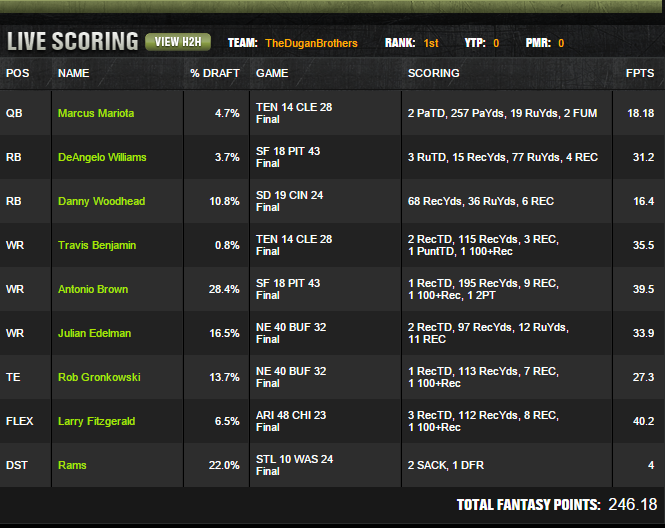 and Michael Crabtree($4,100 – 29.1pts.). Kathy843 finished 4th overall for a check worth a quarter of a million dollars, and 0.03 points more would’ve made that a half million dollar check. 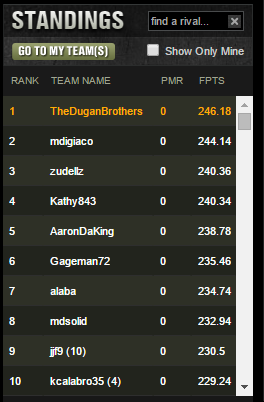 The overlay in DraftKings this week was horrible for them but GREAT for us!!! Overlay, as it refers to DFS, is any time a guaranteed contest doesn’t fill which increases the odds for us to win. Week 1, DK only filled 520,448 of 572,500, which increased the chance to place in the money from the 21.96% to 24.15%. Week 2 was even worse for them as they only filled 426,105 of 572,500, raising your chances to an absurd level of 29.92%. Week 2 was a great opportunity to take advantage of the low entries. And DraftKings is no dummy… they’re losing money, so their current largest NFL tournament has been downgraded to a $7 million pool with 1st prize being $1.2 million. Max entries for this contest is now 400,700 and they only payout the top 83,000, which does drop the previous percentage to win money from 21.96% to 20.71%. In DraftKings, the Flex spot was used with WR’s and TE’s in 9 of the top-10 winnings teams. This goes back to last week’s article referencing the semi-new Air-It-Out NFL. Travis Benjamin; owned by 8 of 20 top teams was the best value play, costing only $95.77 per point. He scored 35.50 points with a salary of $3,400. Matt Jones was the 8th highest scoring player in DraftKings in week 2 and was owned by a whopping 0.00%. 3rd – Allen Robinson – $4,900 – 0.60% – 36.50 pts. 4th – Travis Benjamin – $3,400 – 0.80% – 35.50 pts. 8th – Matt Jones – $3,500 – 0.00% – 31.60 pts. 12th – Derek Carr – $5,500 – 0.00% – 30.34 pts. 14th – Michael Crabtree – $4,100 – 0.40% – 29.10 pts. 15th – Torrey Smith – $5,400 – 0.40% – 29.00 pts. 17th – Cam Newton – 7,200 – 0.60% – 28.40 pts. Dexter McCluster, previous do-it-all for the Chiefs, but now with the Titans, scored 16.40 points at a salary of $3,000. Julian Edelman is somehow priced as the 11th most expensive WR. Yet, he’s currently the 3rd highest scoring WR in DraftKings. Ladies and gentlemen, remember to keep it fun first and foremost. But after that, do your best to demolish everyone! Put these strategies to the test this week at FanDuel Promo code FREAK. Lock in the max bonus possible. Legal, legit and awesome!